I find that my drawings contain a blend of my daughter as a child and as an adult. 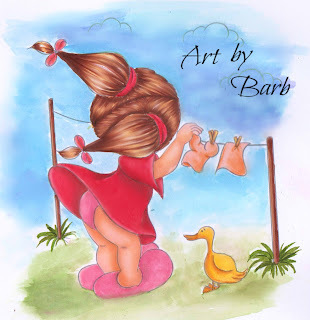 This is exactly how she'd be dressed to hang out the washing today, in an over sized T.shirt and draws on show and a little bit of creative licence from me, because I don't think we own a duck! It's a dreary day here in the UK, so I coloured an appropriate image to suit the day. I used every colour medium that I own, promarkers, copics, coloured pencils and watercolours for the background. Usually, I don't bother with a background, but a while ago I bought watercolour pens and I really need to find a way to use them as they sit unloved in my craft cupboard. Can't have that! I really like how the background finishes the pic. Definitely be doing more backgrounds! Visit Art by Barb group if you like the image and fancy colouring it yourself. Absolutely love the cheeky girl. Your background came out wonderful.